Reuters reports that Libyan troops of the new government have taken the airport of the southern desert city of Sabha, a key site on the route down to Niger. Sabha is one of four small cities of about 120,000 each that are still held by pro-Qaddafi forces. AP reports that the Transitional National Council fighters met little resistance as they entered Sabha. Also in the south, TNC forces captured General Belgacem Al-Abaaj, Qadhafi’s intelligence chief in the Al Khofra region. 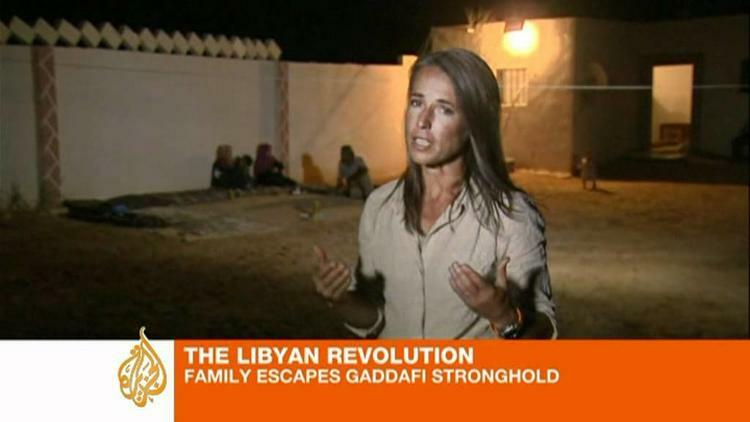 Aljazeera English reports on the reign of terror by Qaddafi forces in the city of Bani Walid. Escaped dissidents say 90% of the city actually hates Qaddafi, but are repressed by the well-armed and -organized pro-Qaddafi fighters. The anti-AlQadhafi radios, Voice of Free Libya (VOFL) from Misratah, VOFL from Benghazi, and Libya FM on 19 September discussed the anti-Al-Qadhafi troops’ endeavours to seize the cities of Surt and Bani Walid and the postponement of formation of a new interim government. Monitored from 1000 to 1700 GMT, the radio stations mainly carried discussion programs and religious and patriotic songs. Libya FM quoted Hisham Abu-Hajar as saying that Al-Saraya al-Hamra (Red Brigade), which includes 600 fighters, was tasked to pursue and arrest ousted leader Mu’ammar al-Qadhafi. He said that he had devoted all his wealth to finding Al-Qadhafi alive or dead. He said that Al-Qadhafi was near Sabha, the stronghold of tribes that were very loyal to the former regime. Libya FM said that OPEC had recognized the Transitional National Council (TNC) as the representative of Libya in the organization. VOFL in Misratah said that the anti-Al-Qadhafi forces in Misratah controlled the southern area of Surt. It quoted a field commander as saying that the forces seized an airbase and some military vehicles in the city. Misratah hospital said 10 fighters were killed and 54 wounded during the troops’ advance to Surt, the radio reported. The radio station quoted a field commander as saying that “the biggest problem is that there are children and civilians in the city and we do not want to use Grad missiles or heavy artillery”. The radio station said that the anti-Al-Qadhafi forces intercepted a phone call by a commander of the Al-Qadhafi troops that indicated that Al-Qadhafi’s son Al-Mu’tassim was in the southern suburbs of Surt. The troops loyal to the TNC also advanced to Surt from the eastern front and were 8 kms from the city, VOFL reported. VOFL quoted the TNC forces’ official in charge of negotiations in Bani Walid as saying that there were fierce battles there. He expected that the anti-Al-Qadhafi troops would control the city within the next two days. VOFL quoted him as saying that there were talks with Al-Qadhafi forces in Bani Walid to allow more families to leave the city. Libya FM said that anti-Al-Qadhafi troops in Sabha had seized several districts in the town. VOFL in Benghazi said that fierce battles had broken out between pro-Al-Qadhafi forces and forces loyal to the TNC in Waddan town. VOFL in Misratah quoted Mahmud al-Nakku, the TNC diplomatic representative in London, as attributing the decision of postponing the announcement of a new interim government to disagreements on ministerial portfolios. VOFL quoted the general official of the Muslim Brotherhood (MB) in Libya, Sulayman Abd-al-Qadir, as denying holding any official talks with the movement on the formation of the interim government. He said: “We want the voice of all the political forces to be heard without exclusion”. He said that MB members’ presence in the line-up of the government or the TNC was part of full citizenship rights and this applied to all political groups. A speaker called Salim in a discussion programme on Libya FM called for introducing a multi-party system based on citizenship and equality away from any quota system in the allocation of official posts. Libya FM quoted the British newspaper Financial Times as saying that the leaders of Misratah were behind the postponement of the announcement of the new interim government because of “their insistence on having a distinguished position in the new government line-up”. Presenters of Benghazi radio station’s daily discussion and phone-in program “Free Men on Air” called for rejecting tribalism. They urged unity and warned of conflict between tribes. Libya FM quoted the commander of the Tripoli Military Council, Abd-al-Hakim Bilhaj, as saying that “we aspire to establish a democratic civil state”. He said that stability was being restored gradually in Tripoli.